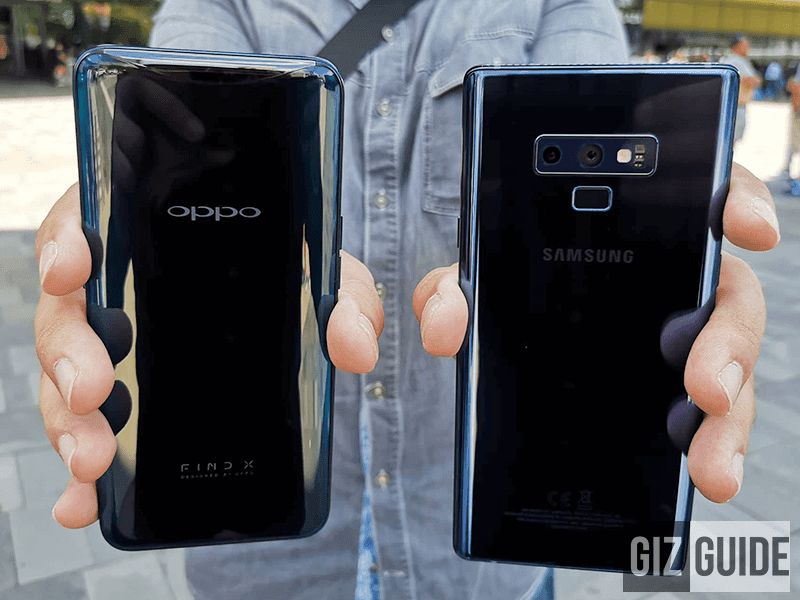 The Samsung Galaxy Note9 has just launched and we decided to compare it with one of the prettiest smartphones today, the OPPO Find X. Team Find X or team Note9? With the launch of the Samsung Galaxy Note9 it is inevitable that we do a comparison with another flagship. One of the hottest ones now is the OPPO Find X. We are going to pit the Samsung Galaxy Note9 against OPPO's latest flagship the Find X. Lets see how these two beasts fare. These two phones are definitely worth the tag "flagship" as both sport premium design, feature, build and specs on paper. 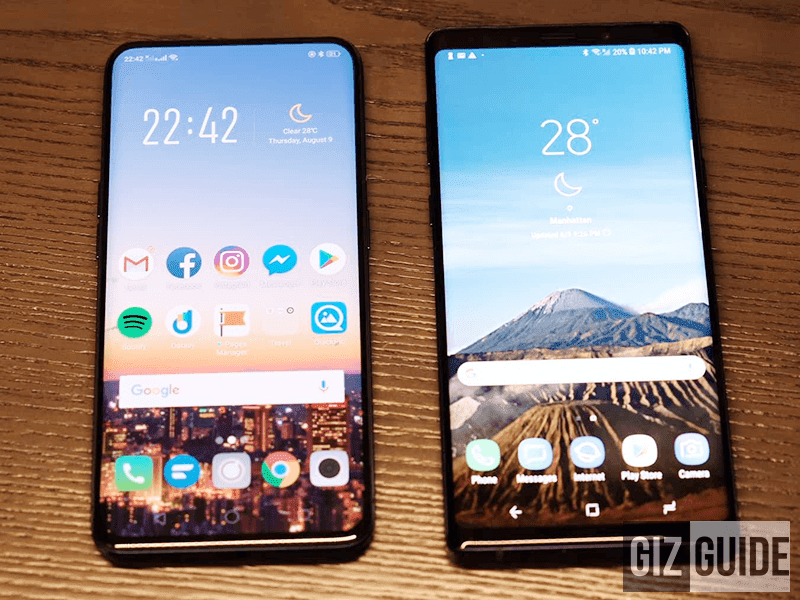 Display - The Note9's 6.4-inch Curved Super AMOLED Infinity display runs at 2960 x 1440 resolution with a pixel density of 514 ppi while the Find X has a 6.4-inch Curved AMOLED screen at 2340 x 1080 resolution with 403 ppi pixel density. Both has Corning Gorilla Glass protection. On paper, the Note9's display edges out the Find X due to a higher resolution and better pixel density. Specs - The Note9 has a 64-bit Exynos 9810 octa-core processor clocked in at 1.79GHz, Mali-G72 MP18 GPU, either a 6GB/8GB of RAM, 128GB/512GB internal storage with expandable storage via microSD card of up to 1TB and a 4000mAh battery with adaptive fast charging and wireless charging. The Find X, on the other hand, has a 64-bit Snapdragon 845 octa-core processor w/ Qualcomm Artificial Engine clocked in at 2.8GHz. It has an Adreno 630 GPU, 8GB RAM, 256GB internal storage and 3,730mAh battery with VOOC charging. In terms of processor both are under the 10 nm processor. The Find X has the advantage in the GPU department. In terms of RAM and storage option, the Note9 takes it since it has two variants and option to expand. The battery battle goes to Note9 as well since its bigger and has wireless charging. Cameras - The Note9 has a dual camera setup sporting a 12MP (f/1.5/f/2.4) + 12MP f/2.4 telephoto lens with Dual Pixel, Dual OIS, multi-frame, and dual tone LED flash. The Find X has a dual setup as well with 16MP f/2.0 Sony IMX519 + 20MP f/2.0 Sony IMX376k with AI Recognition and LED flash. In terms of the front cameras, the Note9 has an 8MP f/1.7 with AF, wide-angle lens, and screen flash while the Find X sports a 25MP f/2.0 Sony IMX576 with 3D AI Beauty Technology and AI Portrait Mode. On paper, the Note9's rear camera features is more impressive compared to the Find X's while for selfies, the Find X's looks to have the advantage. Other Features - The Note9 has a lot of additional features including the Intelligent S-Pen, IP68 water and dust resistance, and the UHQ 32-bit/DSD audio support. The Find X also has some tricks up its sleeve with the innovative mechanical feature for the selfie camera and other sensors to achieve a truly notchless and nearly bezel-less design and the 3D Face Unlock. However, in paper, the Note9 takes this category. For a flagship battle, this is an amazing one to do. Both of these flagships has their advantages and warrants a recommendation from us. If you want more variants, go for the Note9. If you want a smartphone with a new innovative design, then go for the Find X. One thing's for sure, you cannot go wrong with either one of them.